The Berkeley folding base is rated best in its class due to its heavier gauge steel construction, larger footprint and additional height adjustment, all of which makes this the most sturdy table in the industry. 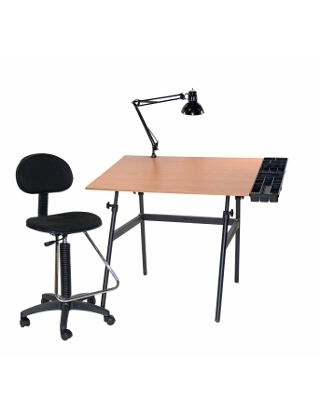 On top of this base Martin supplies their famous 30 x 42 inch Martin Drafting Board Top made of solid high density, non-directional pressed wood covered with an eye ease laminate. The combo includes the original side tray crafted by Italian designer Giovanni Pelis and lamp with ceramic socket. The finishing touch is the ergonomically designed chair. Shipped ready to assemble.